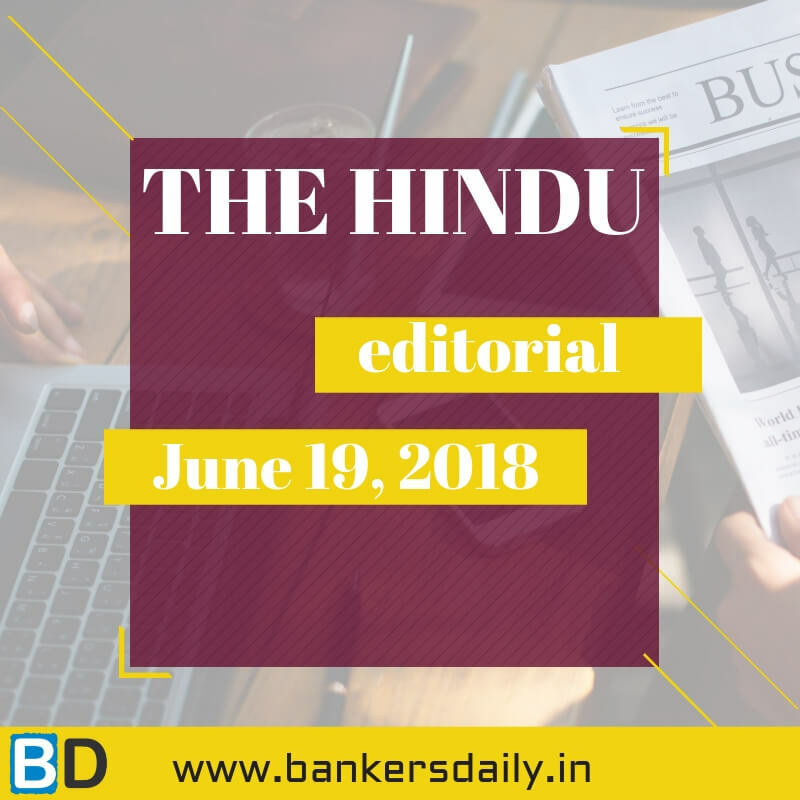 THE HINDU EDITORIAL – June 29, 2018 is one of the must read for the competitive exams like SBI PO Prelims , SBI CLERK Prelims Exam, BOB PO Manipal Online Exam and South Indian Bank PO Manipal Exam. These topics are widely expected to be asked in the reading comprehension , Cloze Test or in Error Detection topics in the forthcoming exams. So gear up for your Exam preparation and learn new words daily. The rupee’s troubles just do not seem to end. On Thursday, the currency weakened past 69 intraday against the U.S. dollar, an all-time low. The rupee, which has lost almost 8% in value since January 1, is the worst-performing currency in Asia this year. It is, however, not the only currency to be in the doldrums. Emerging market currencies as a group have witnessed a sharp correction in their value against the dollar this year. The MSCI Emerging Markets currency index, for instance, is down about 6% since the beginning of April. The rise in international crude oil prices is one of the reasons behind the rupee’s decline as importers have had to shell out more dollars to fund their purchases. India’s current account deficit, which jumped to 1.9% of GDP in the fourth quarter of 2017-18 from just 0.6% a year earlier, is now expected to widen to 2.5% in FY 2019. This could spell even more trouble for the rupee as the demand for dollars could turn out to be overwhelming. The dollar index, which gauges the value of the dollar against a host of major global currencies, is up about 7.5% since February. The rise in global trade tensions amidst the ongoing trade war could be another factor behind the rout in emerging market currencies, but its impact on the rupee remains unclear as of now. But by far the most important reason behind the fall in the rupee and other emerging market currencies is the tightening of U.S. monetary policy. Investors attracted by higher yields in the United States have been pulling their capital out of India at an increasing pace over the last few months. Foreign portfolio investors, in fact, took out ₹29,714 crore in May, almost a doubling of outflow compared to ₹15,561 crore in April. Most of the foreign fund outflow this year has come out of the bond market, which explains the steep fall in Indian bond prices. None of this turbulence in emerging markets, however, is surprising. The tightening of monetary policy by the U.S. Federal Reserve has traditionally caused the turning of the global credit cycle, which eventually leads to various crises around the world. It is hard to determine if the worst is over yet for emerging market currencies. But the fact that the American central bank expects to raise interest rates further this year suggests that more pain could be in store. The government, as well as the Reserve Bank of India, which recently raised domestic interest rates in response to rising external economic risks, may need to think out of the box to avoid a crisis similar to the taper tantrum of 2013. A quiet but accelerating movement protesting the savage effects of corporate funding in politics appears to be under way within the broad swathe of the U.S. Democratic Party. This week it claimed its latest victim in the form of Congressman Joe Crowley of the House of Representatives, whose re-election campaign primary in New York bit the dust when 28-year-old Alexandria Ocasio-Cortez swept to victory. It was telling that, in sealing her win she spent a mere $200,000 compared to his $3.4 million war chest and won despite this being the first time in 14 years that Mr. Crowley, who is 56, faced a primary challenger. Ms. Ocasio-Cortez’s win will likely reverberate through the Democratic Party, and possibly put the Republicans on notice as well, for it was built on an entirely different ethos from the unfettered rein given to corporate America by the Citizens United decision of the Supreme Court in 2010. Ms. Ocasio-Cortez rejected corporate donations throughout her campaign for the Democratic nomination to the House seat, arguing, “You can’t really beat big money with more money… You have to beat them with a totally different game.” She made it a different game regarding campaign finance, where she contrasted her strategy of connecting with communities to Mr. Crowley’s considerable donations from corporate Political Action Committees, and also seized the momentum on immigration. President Donald Trump’s “zero-tolerance” approach towards undocumented migrants on the southern border has resulted in the unconscionable separation of at least 2,300 children from their parents. While the separations are being vigorously challenged in court, energised progressives such as Ms. Ocasio-Cortez have gone on to call for the abolition of the Immigration and Customs Enforcement agency, and to join protests at the child migrant detention facilities. When she emerged as the embodiment of these multiple strands of progressive politics, she gained tremendously from campaign endorsements by Justice Democrats and Brand-New Congress, PACs linked to socialist-Democrat candidate Bernie Sanders’ 2016 presidential bid. Firm in their rejection of dark pools of corporate money, Justice Democrats has officially endorsed 58 other candidates, some of whom have registered early victories in primaries, for the House and in one case for a gubernatorial race. However, there appear to be more forces at play than simply this eschewing of Wall Street bucks. In constituencies such as Queens and Bronx in New York, and innumerable such neighbourhoods across the U.S., a multi-racial, gender-balanced social fabric has taken hold, replacing an older white-centric, male-dominated space that threw up the political representatives demanded by the system. The Democratic Party would do well to look closely at these insurgencies and shifts occurring beneath its feet and adapt to accommodate sparky leaders such as Ms. Ocasio-Cortez. Their opponents across the aisle are anyway in a different mood. Meaning: Occurring within one day. Meaning: A state or period of stagnation or depression. Meaning: Estimate or determine the amount, level, or volume of. Synonyms: In the middle of, Surrounded by. Meaning: Make or become tight or tighter. Meaning: Exert force on (someone or something) so as to cause movement towards oneself. Meaning: Taper tantrum is the term used for the 2013 surge in U.S. Treasury yields, which resulted from the Federal Reserve’s use of tapering to gradually reduce the amount of money it was feeding into the economy. Synonyms: Speed up, Hurry up. Meaning: (Of something bad or negative) very great; severe. Meaning: Move or push (someone or something) with great force. Meaning: Have continuing and serious effects. Meaning: Not right or reasonable. Synonyms: Strenuously, With great vigour. Meaning: Give vitality and enthusiasm to. Meaning: The process of developing or moving gradually towards a more advanced state. Meaning: A tangible or visible form of an idea, quality, or feeling. Meaning: An element that forms part of a complex whole. Meaning: To a very great extent. Meaning: Offer (a certain price) for something, especially at an auction. Synonyms: Offer, Make an offer of. Meaning: Relating to a governor, particularly that of a state in the US. Synonyms: Abstain from, Refrain from. Meaning: Too many to be counted (often used hyperbolically). Meaning: To produce new problems or ideas. Meaning: Extending or directly underneath something. Synonyms: Help, Fit in with. Meaning: A passage between rows of seats in a building such as a church or theatre, an aircraft, or train.